You get amazing photos that you and extended family members can cherish for years. The session itself is a memorable family event. This quality time with your family leaves you with lasting memories and some physical proof you can put in an album or hang in your hallway. Plus, your kids are going to love it as much as Disney World. But it’s going to be fun! Here are a few tips on making the most of this time together and ensuring you get the photos that capture who you all are as individuals and as a family. We’ll talk before your photo shoot, of course, and during that chat I want to know about your family. What do you love doing together? What unique characteristics do you notice and cherish in each child? What makes you laugh and cry? Knowing these precious details will help me find them during the photo session. Every family photo is different because every family is different. (In good ways! And sometimes weird ways!) What makes you you? Sure, you could all sit on a bench and tilt your heads to the right, but I’d rather have you play and interact with each other. Tell jokes, express your affection for each other, and ask the kids thought-provoking questions (like, “What do you like best about your Mom?” and “Why do you always have to have the red cup at dinner?”). This reveals authentic emotions and reactions, rather than the canned smiles that crop up after, “Say cheese.” I’ll be there to snap a photo of each exchange. Really, don’t worry, period. We could finish that sentence with a lot of things: don’t worry if the kids don’t look at the camera, if they don’t smile, if they spill their drinks, if they throw a tantrum. I understand, as you do, that kids have their own secret manual for living. Sometimes it lines up with adult society, and sometimes it does not–and that’s exactly why kids are incredible. Toys or props. If your child is dedicated to a particular pillow or stuffed animal, bring it along and let’s include it in the shots. Bringing toys for the kids to play with can make for great photos, too. 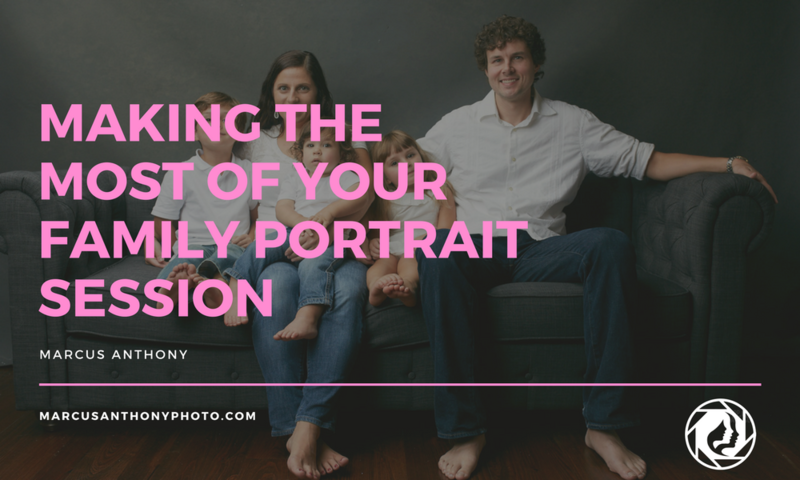 Making the most of your family portrait session means remembering that it’s about the time spent creating the photos as well as the photos themselves. When you approach the session as an opportunity for quality time with the people you love most, the photos are brilliant every time. If you’re interested in getting family portraits done, I offer complimentary phone or in-studio consultations. Click here to get in touch!